The pavé setting was created with maximum light and brilliance in mind. To create these stunning rings, accent diamonds are set closely together for a dazzling, diamond encrusted look. The word pavé comes from the French word for “paved,” so these engagement rings look as if their surfaces have been paved with, creating a glittering, unbroken expanse of light and sparkle. Small beads of precious metal are applied in the spaces between the diamonds, securing them in place. The goal of this setting is to cluster diamonds as close as possible with the least amount of visible metal. This setting allows diamond rows to be placed very close to each other, creating a solid swath of diamonds and light. A popular style of pavé engagement rings features a band covered with pavé set accent gems to enhance the center diamond. 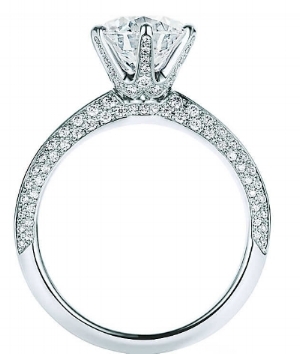 There are endless ways to integrate pavé set diamonds into your engagement ring’s band. For example, you can choose delicate pavé diamonds surrounded by milgrain for an antique look, or opt for a ring with three rows of pavé diamonds to create a glamorous band of light.